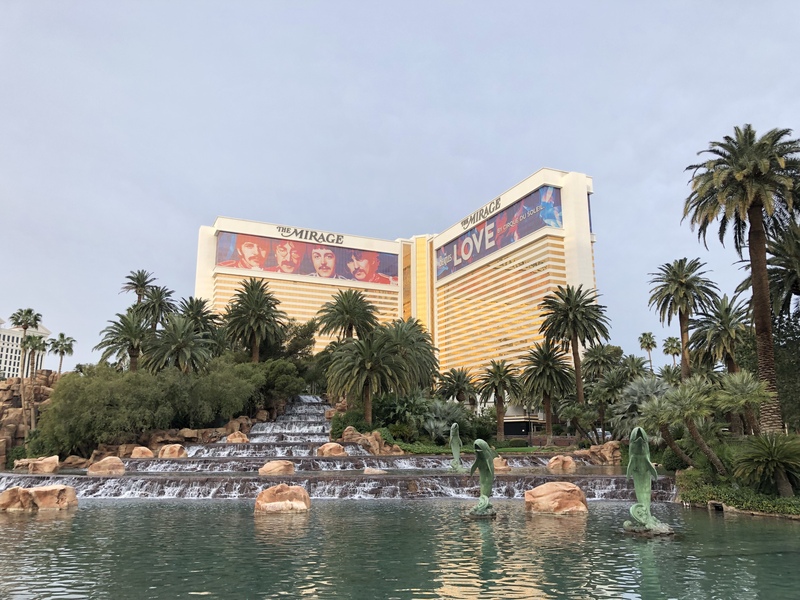 Flew for business reasons, to attend the Re:Invent technology conference from Amazon Web Services (AWS) which has grown from the a family sized event to a worldwide phenomenon nowadays. The year was 2013… the passion for trail running was only a small seed in my heart at the time, running however a regular routine. The visit to town has therefore had its moments of hitting asphalt along The Strip, together with my brother in arms Stefan Christoph. Piece of Guidance: Le Rêve / The Dream show at The Wynn is an absolutely astonishing work of art which I’d rate as a must-see in town. Regardless the schedule or the budget you have while in Vegas, make sure you find a way to go and watch this act. It is breath-taking! Piece of guidance: Ka is a bewildering performance from Cirque du Soleil which you can find at MGM Grand. The show was outright mind-blowing! Make sure you have it as part of your bucket-list. The one thing we ended up not doing was visiting the Grand Canyon. A small window of opportunity presented us the option to go there by helicopter. Time-consuming, expensive, non-shareable experience with the family, hence… we’ve let it pass. Would’ve definitely been a great experience but the indecisiveness of our reasoning and ultimate hesitation left us to conclude we’d do it next time. It’s now been 5 years and the chance to join the IBM Think conference this March, got my running-self into a genuine vigilant state. Perhaps the Grand Canyon would be an adventure I wouldn’t let escape again! Following the days of a very intensive event, bringing brilliant thinkers from the four quadrants of the world, my agenda offered a full day on my own, prior to the return flight home. 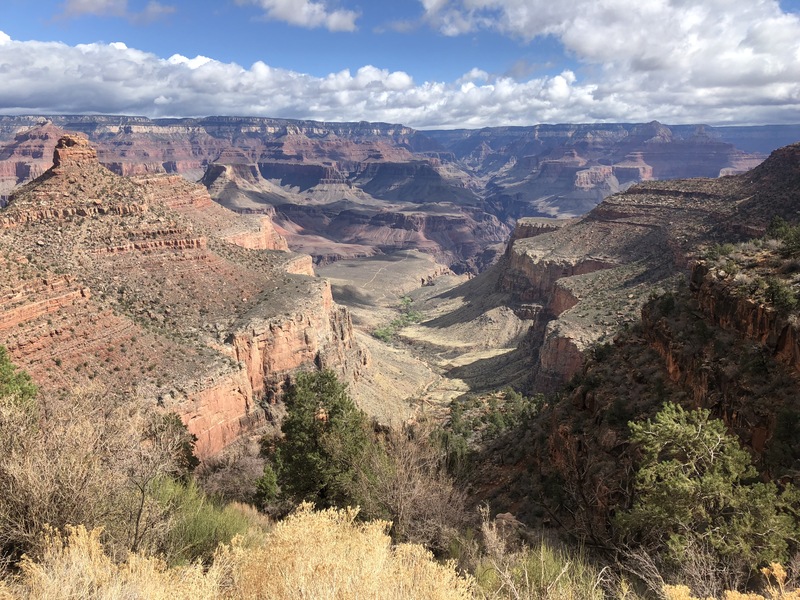 I’ve set out on a hunt to understand how to get to the Grand Canyon National Park in Arizona and the implications of a travel which had nothing short of complex for the time I had available. Finding plain transportation options for the South Rim was hard, as I quickly realised that most companies operated day-tours only. While this would allow me to visit the Grand Canyon as a tourist, running through its trails would be nearly impossible as the time window would be too short. Discovering a company that would allow me to use a combination of day-tours to go there and stay overnight, was even harder. I made it though! The solution was to fly out in a propeller, stay overnight and return the next day on a bus. Piece of guidance: Grand Canyon Tour Company was the only agency providing the option of combining day-tours into a combined package. They provided a good discount, were easy to reach, swift to provide feedback and very competent carrying out the tour itself. Plan 3 to 3.5 hours if you fly, as you need to account for the time spent on the bus that picks you up at the hotel. Plan 5 to 6 hours for the option to travel by bus, which includes a mid-drive break for stretching your legs and getting food/drinks. Other agencies scouted were Canyon Tours, Papillon and Grand Canyon Scenic Airlines to name a few. The outbound flight provided great views of the canyon. While it was a bit foggy at start, clouds gave way for sights of high plains, rugged terrain of several colours with the pristine blue of the Colorado River below. From high skies it looks as if the land was cut by a gigantic rugged knife, water bleeding from an open wound, as if the earth’s crust had its skin torn apart beyond sight. Through miles and miles, the contour of the river criss-crosses the ancient mountains, its slopes’ hues and dyes contrasting with the opaque brown of the flatland. A magnificent demonstration of nature’s greatness and our own insignificance. I arrived on a Thursday afternoon and decided to take the bus tour as the means to get familiar with the surroundings. We received lunch from the tour guide and a slight sense of hunger brought me back to reality. I don’t recall any longer what I ate… only that it was one of the best meals in a long time, of enjoyment and calmness. When the time arrived to move on to the next stop in the tour, we were taken to Mather Point, a cliff pushing northwards from the South Rim. It provides deep views into the valley with an absolutely astonishing clarity. When I arrived, the place was sparsely crowded, making it easy to wander around and sink in the multiple viewpoints, from all its varied angles. The absolute best of all was to engage in a conversation with a cyclist that had been 4 months in the road. Taking a break from work, he sure had the look of someone exposed to the elements and immersed for a long time in the outdoors. Having time to engage with people can be a wonderful thing… He told me about the diverse locations he had been, from gorgeous places in the east coast to natural retreats in inland states like Nevada. While travelling in a road next to the canyon, he decided in real-time to pay a visit, even though it would not his first time. He gazed at the landscape as someone that had also lost his sense of awareness… it intrigued me to see such a self-alike character in the middle of a growing crowd of folks that couldn’t stop still, speaking out loud, taking photographs, yelling remarks to their peers, seemingly unable to appreciate the silence and stillness of it all. I spent a considerable amount of time having a conversation with such a stranger. A talk like the ones you have with a long-time friend with whom you share passionate common interests and haven’t been with since ages. It’s a wonderful thing to have time… to truly perceive time as the most precious thing you have in life. From this point on I’d quit the bus tour as it would be taking people to the airport for a return to Las Vegas. Not for me though… it was time to pay a visit to the Yavapai Lodge, drop off my backpack and get acquainted with the establishment where I’d spend the night over. The time had come to realise that this was indeed not a day tour and there was a lot of planning to be done if I’d want to be running the next day in the canyon. The queue at the reception was minimal. With high-season a couple of months away, it took me no time to get to the counter. The staff was super-friendly, welcomed me with a wide smile, ensured I was made aware of the water shortage in the park and that I’d take away appropriate advise on how I could contribute to save water. Leaving on a Friday, I was given no slack for having the luxury of late-checkout and hence was informed that by 11 o’clock latest I’d need to leave the accommodation. Piece of guidance: Yavapai Lodge is a great location for an overnight stay. An all-natural, rustic accommodation, reasonably-priced, clean, centrally located, neighbour to the supermarket, walking distance to a bus stop and a reasonable 10 min walk away from the rim. A no-brainer if you look for housing inside the park. Typically fully-booked, make sure you plan a reservation in advance. A good alternative is Bright Angel Lodge situated at the edge of the rim. The National Park offers a great guide to aid on finding your way around: sightseeing locations, how to route through the Trail of Time along the South Rim, information of the free coloured bus lines that constantly circle the park, places to eat and where to crash for accommodation. I studied it all prior venturing myself further into exploration mode. Conscious of being alone in a location far away from Las Vegas, from where my plane back to Europe would be departing on Saturday morning, I didn’t want to take any unnecessary risks. Knowing exactly where I was and how to navigate around was my top priority. Piece of guidance: check out the Grand Canyon National Park website for plentiful information about what to expect. The Pocket Map is a must to have with you: make sure you print one to take along or get one at the entrance of park. No matter how much you love long walks and/or hikes, take a good look at the network of coloured buses which you can take for free at any point in time. Engage in conversations with the drivers: they’re absurdly friendly and will for sure boost your good mood. So what was the running adventure being thought of anyhow? The two most common hiking routes on the South Rim of the Grand Canyon are the South Kaibab Trail and the Bright Angel Trail. The first has its trailhead east of the Canyon Village and offers a well-marked single trail 1,600 meters downhill descent all the way to the Colorado River. The second has its trailhead west of the Canyon Village and descends to the river through the Bright Angel and Indian Garden campgrounds. Both trails are cut across mid-way by the Tonto Trail, connecting them longitudinally. Any undertaking to get from the South Rim all the way to the river in a single day is not only not recommended by the National Park Service (NPS), at it is highly unadvised! On a multiple day hike, doing the course counterclockwise, i.e. descending the South Kaibab Trail and ascending the Bright Angel Trail is the National Park Service‘s recommended direction of travel. While water is available year-round in the Bright Angel Trail, the South Kaibab Trail has none at all, hence self-sufficiency is mandatory. The planned undertaking was a 35 km run with a total 3,200 meters elevation gain, starting around sunrise at 6 o’clock and with a maximum duration of 5 hours, in order to be able to make it in time for the lodge check-out at 11 o’clock. Piece of guidance: Trail Run Project is a website containing user-generated guides for fuelling your runs. It contains a complete trail directory, each inventory item containing comprehensive stats from the route, such as length, profile, elevation data, GPS data, an extensive description and ultimately user ratings and comments. The catalogue is particularly relevant for the United States, with Europe items existent yet sparser than desired. 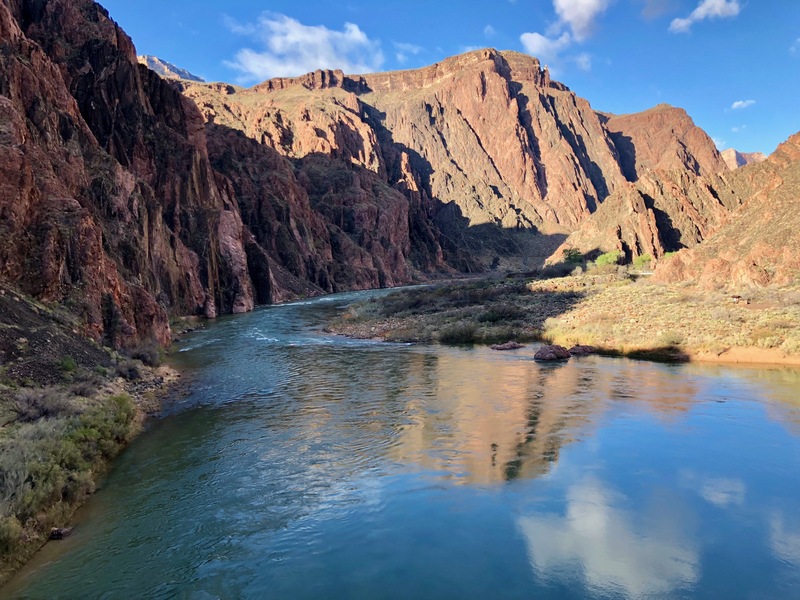 Caroline Cordsen wrote an excellent entry at Trail Run Project titled South Kaibab / Bright Angel Loop, which has been the single best piece of writing I’ve encountered and which delivered exceptional value to my endeavour. 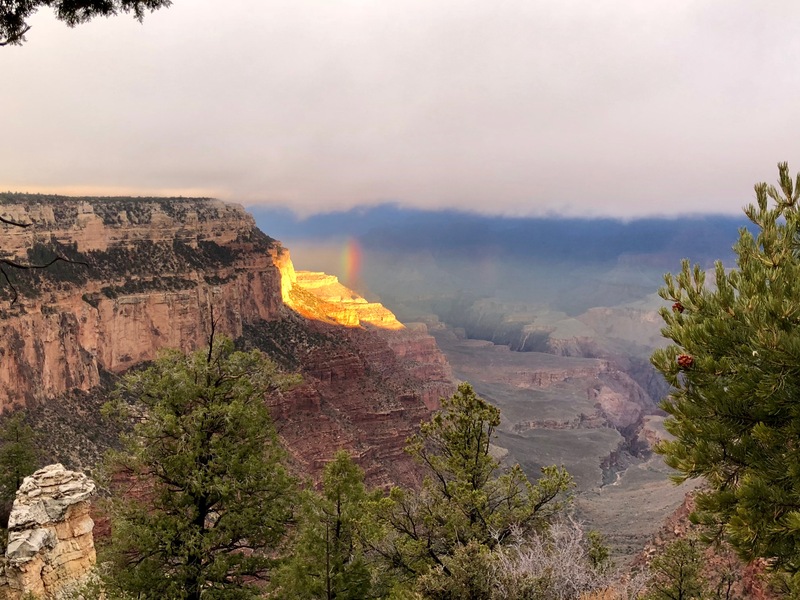 If you’re looking for details on where to find the trailhead, how the descent through the South Kaibab Trail looks like, what to cater for along your way to Colorado River and back up through the Bright Angel Trail, then spare no time and go there check all the details. Her description is spot on, from what you can expect to practical information you should take with you. I had my own doubts when hitting the lodge in the evening, of whether I should continue with my adventure or not… in particular when doing it solo. I had to take time evaluating my past races such as the Douro Ultra Trail, the Eiger Ultra Trail or the Zugspitz Ultra Trail to realise that I had the experience, the fitness, the training, the physical and mental condition to be able to safely put myself into such position. In case you read this and think of the possibility of venturing yourself into a similar undertaking, please take the Grand Canyon NPS advice into careful consideration and evaluate your own capabilities. I carefully planned everything the evening before the run: prepared the backpack, calculated the amount of self-sufficient water I’d carry, security materials, reviewed the course, the timings I planned to hit particular spots, what would be my escape points (e.g. telephone at Tipoff, shorter route through the Tonto Trail) and all the relevant trail rules (in particular how to properly behave when crossing mules). I had dinner at the Yavapai Lodge that evening and prepared myself to have a good night sleep. I’d be getting early morning out of bed and wanted to ensure the body would be rested and the mind free. Piece of guidance: food in the Canyon Village can be tough to please. If you’re used to American food then you’ll be fine 😉 If however you won’t be able to sustain it over several meals, I’d recommend hitting the Bright Angel Restaurant or alternatively the seemingly best option El Tovar Dining Room (book in advance as I was too late). Next to the Yavapai Lodge is a supermarket which can help you with groceries. I got up shortly before sunrise and set myself into it. There was a drizzling rain coming down from a cloudy sky, refreshing the skin, washing out the soul as the body got deeply in touch with nature the moment I stepped out of the door of the room. For details of how the route looks like, the different layers of the Canyon and how they influence your perception of your surrounding, creating a diverse experience as you cross them, I definitely recommend you go through Caroline‘s narrative. My story of the Grand Canyon will always be mine and mine alone, difficult to portray in a written form, a challenge to the human senses, so alive and yet so wordless. 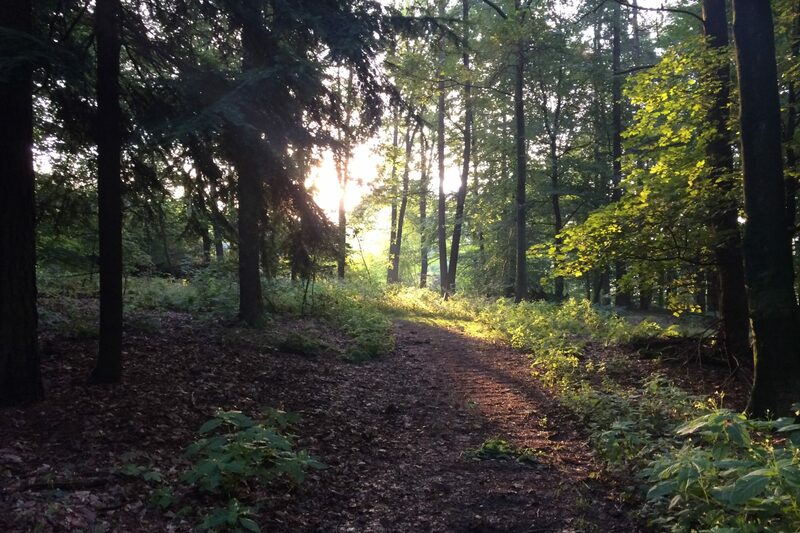 I’ll always remember it as one of the best running experiences I’ve ever had, as well as one of the emotional human experiences I had with Mother Nature. Don’t hesitate for a second!!! Seize the opportunity when you have it! It is a place of WONDER! My delight when crossing the Bright Angel Suspension Bridge.